The craze for nano tanks is definitely among us. In recent years there have been many improvements in filter technology and lighting that enable us to keep them successfully. 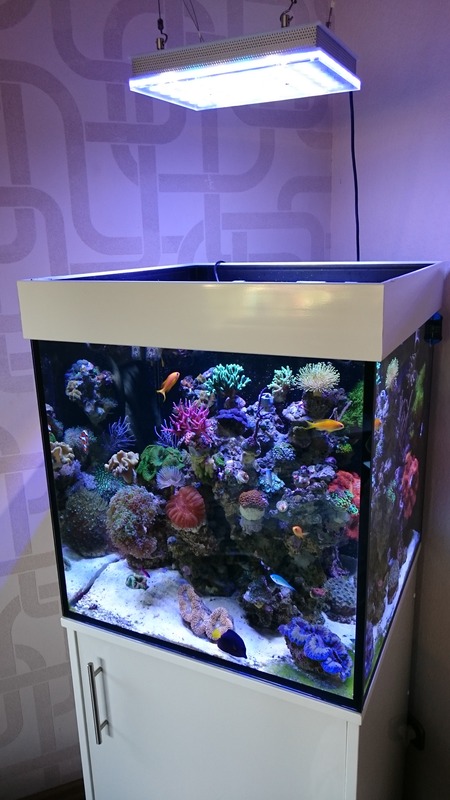 The beauty of a full size reef can be obtained in a much smaller area if care is taken choosing the equipment and animals to run the tank efficiently. Let it be clear that aquariums of 20 gallons or less can become chemically unstable in a very short time so weekly monitoring of all water parameters is imperative. Because of the small volume of water in nano tanks, nitrate and phosphate levels can build up quickly so care must be taken to ensure your selection of animals is kept to a moderate level. Sparse feeding a few times a day is much better than one large feeding once a day. There are manufacturers that produce turnkey nano aquariums complete with all the necessary equipment. We have put together some guidelines that are necessary to have a successful nano aquarium whether you decide to build your own or go with a turnkey nano aquarium. Just like their big brothers, good water flow must be obtained to prevent waste from settling in corners or dead spots in the aquarium where it can be converted to nutrients if not removed. The minimum recommendation for water flow is ten times the gallon size of your tank. It is highly recommended to use a good grade of carbon and phosphate remover. Some turnkey nano tank systems incorporate trays where bags of carbon and phosphate remover can be placed and easily changed. Be wary of turnkey systems to ensure that the pumps provided can give you the necessary flow. With nano tanks, protein skimming is a must to prevent nitrate and phosphate build up in your tank. Innovative Marine produces very good skimmers for this purpose. If you choose to set up your own nano tank and forego turnkey systems, a sump is beneficial to the overall health of the tank. A sump increases the volume of the tank water and help to keep water parameters more stable than without one. It is also a good place to put a more efficient protein skimmer as well as a heater and other accessories. Care must be taken when selecting lighting for your nano aquarium. Lamp fixtures with multiple tubes can quickly warm the water to temperatures that may not be desirable for the animals you intend to keep. This can cause large temperature swings from day time to nighttime which most animals do not appreciate. LED lighting is the best solution by far and Orphek has models suitable for different sizes of nano aquariums. This is where carefully choosing the fish is very important. Fish chosen for a nano aquarium must be compatible with each other. In small systems it doesn’t take much to start a feud among fish, especially if they have a territorial nature. Too many fish for the volume of water leads to an instant tank crash. Using the list below, we recommend three fish maximum for each 10 gallons of water. Below is a list of fish that are suitable for nano tanks. Under no circumstances should you place coral that have an alleopathy nature. Euphyllia coral are notorious for this. Regular maintenance is necessary for keeping nano aquariums chemically stable. It is recommend that weekly water changes using RO/DI water of at least 10 percent be performed. Ammonia and nitrites should always be at zero. Nitrate levels should not exceed 15ppm with 0 being optimal. The pH should also be kept stable between 8.2 and 8.4 and maintaining calcium levels of 400-450ppm will aid in doing this. The dKH is also important and should be kept between 8 and 12 dKH. The protein skimmer should be emptied and the riser tube cleaned on a daily basis. Specific Gravity should also be monitored closely as water evaporation in small systems can alter the specific gravity of the water quite quickly. Never treat the tank for diseases, always remove the affected fish to a quarantine tank. Treating fish that do not require it just places undo stress on the fish. Nano tanks are definitely not for the beginner but is not impossible to do. The above guidelines should help you get a successful start but do not limit your information to this alone. It is best to read all you can about nano aquariums before you get started.